Most surely. 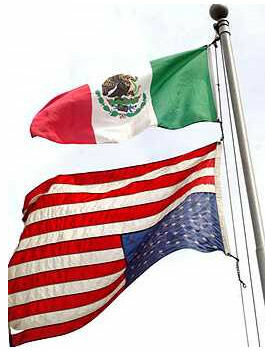 As others have commented, the huge 2006 protest in LA actually gave a major boost to anti illegal immigrant sentiment. The public outrage over the antics of the illegals that day made the nation much more aware of just how serious the situation had become. The illegals shot themselves in the foot in 2006, so to speak, and did so again the following year in the MacArthur Park riot. They seem to have realized their mistakes. In recent years the violence has been toned down a bit. Fewer flag burnings, not as many communist flags and banners, more American flags, and so on. Still though, every time they march or hold a demonstration they just anger and harden the resolve of the general citizenry against them. This part they still do not get. Do you mean these antics? Last edited by SFBAguy; 04-30-2011 at 09:43 AM..
Let LA's Mayor Villaraigosa take the hit. He's going to furlough City Workers to help with LA's budget yet at the same time he's constanly defending and praising LA's Illegal Aliens. His qoute was "they clean your toilets" next it will be they protest, riot and then sue the LAPD. LA deserves this for electing such an inept pro Illegal alien Mayor. This Chicano cleans his own damn toilet. I dont need no illegal to do me. Villaraigosa needs to keep his mouth shut cause make makes ALL of us look bad. Anyone else notice how they always hold these marches in areas of a city where decent, law abiding citizens don't feel safe entering into? They should march, but LAPD should be in full force when they do. If illegals are the ones marching, then it's really a march of criminals and the cops can arrest them. What would be really entertaining is to see them out with their gigantic Mexican flags and Che Guevara t-shirts and signs. Let them shout all their anti-American rantings. Let them chant "viva Mejico!" for all their worth and show their immense nationalist pride. Then have the ICE vans pull up...... Let them be given their chance to return home to that country they claim they're so proud of - where they can speak the language and where they fit into the culture, and they can take their flags home with them. Yeah, they should call in riot control, SWAT, and ICE. They can bring in those buses and drop them off in Tijuana. (although illegals who aren't from Mexico should just get arrested and then get sent to whereever their from. A lot of those American flags they were given ended up discarded on the street, or in trash cans after the protest. Illegal aliens may want amnesty, but they don't want to be Americans. Don't EVER stop being an American. I'm honestly disappointed in these people. Do they not have a sense of respect for this country?